When a crime is committed, law enforcement gets the first call. In unincorporated Jefferson Parish, this is handled by the Sheriff’s Office. In many instances, suspects are immediately taken into custody and jailed. However, if the crime is not violent and the charge is minor, an individual may be directed in writing to appear in court on a specific date. 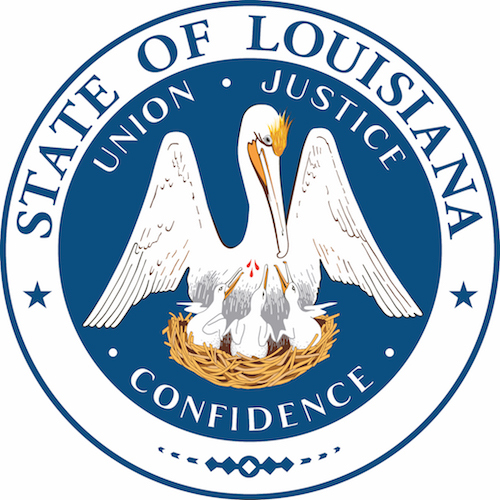 The District Attorney’s Office represents the People of the State of Louisiana. Prosecutors bring criminal charges against suspects in courts of law. 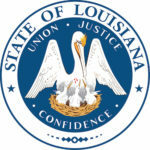 The Jefferson District Attorney’s Office has the responsibility and authority to investigate and prosecute all felonies in Jefferson Parish. Before issuing a case, a prosecutor will review the facts with police investigators and sometimes meet with the victim of the crime. The prosecutor evaluates whether there is enough evidence to support the charges originally brought by police. If the evidence is convincing, the prosecutor will determine the final charges and compile an official list known as the bill of information. In some cases, the prosecutor may decide not to proceed with a case against a defendant. The prosecutor may decline to prosecute, or “refuse” a case if there is insufficient evidence or if more investigation is required. 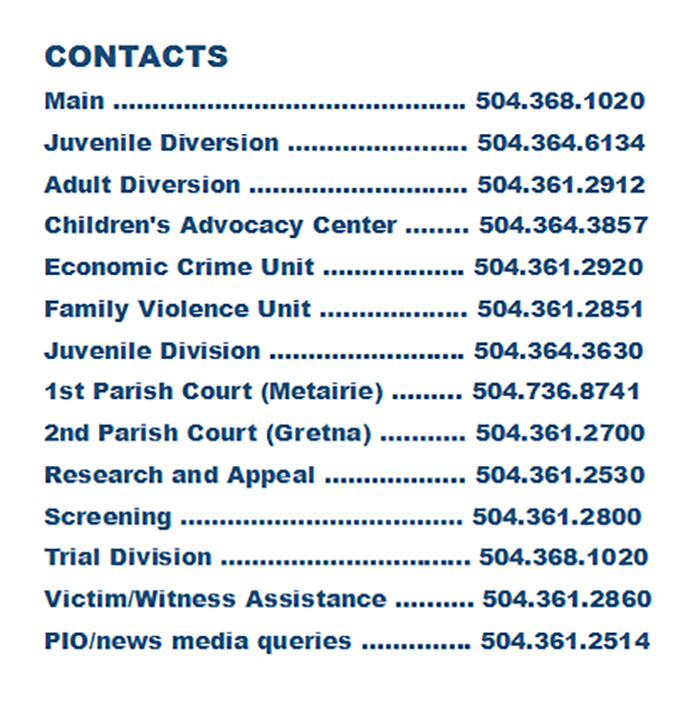 Criminal cases are prosecuted in several different courts in Jefferson Parish, including the 24th Judicial District Court, First Parish Court in Metairie and Second Parish Court in Gretna. An arraignment is a formal reading of a criminal charging document in the presence of the defendant to inform him or her of the charges. In response to arraignment, the accused is expected to enter a plea. Bail is set at the time of the arrest and is often required to ensure the defendant returns to court at a future date. The amount of bail is dictated by a written schedule that reflects the seriousness of the crime. At the arraignment, the prosecutor will request bail in a particular amount, and the defense attorney will usually argue for a reduction. Sometimes, the prosecutor may ask the judge to attach conditions to a defendant’s release, such as having no contact with the victim or restrictions on travel. The judge has the final word. If the defendant posts the amount of money required to make bail, he or she will be released. This is often accomplished by collateralizing a loan or paying a premium to a bail-bonding agency. Some defendants are released without bail on their “own recognizance.” This happens when the judge is confidant they can be counted on to appear in court for all proceedings. If bail is set, a defense attorney may request a bail review hearing at a future date to reconsider the amount of bail. The issue of bail may be raised at subsequent hearings. Typically there are two formal opportunities for the prosecution and defense to negotiate a disposition, or plea bargain, on a case. The first occurs before the preliminary hearing; the second occurs after the preliminary hearing and before trial. In both instances, a judge will sit “in conference” with the prosecutor and the defense attorney and must approve any negotiated settlement. Many cases are resolved in plea bargains at either stage of the proceedings. Guilty pleas occur when the defendant either admits all of the charges or enters into a plea bargain in which the prosecution and the defendant have mutually agreed upon the charges. Plea bargains will include either a stipulated sentence or a sentencing recommendation. A judge must approve all negotiated pleas. Sometimes legal issues must be resolved before a plea bargain or trial may take place. A criminal trial is a search for the truth. It proceeds through the examination of evidence, which includes the statements of witnesses, in a courtroom before a judge or a jury to determine whether a defendant is guilty beyond a reasonable doubt of the charges listed in the bill of information or bill of indictment. Voir Dire, which means to speak the truth, is the name given to jury selection. Either 12 or six jurors and several alternatives are chosen to hear a criminal case. When prospective jurors are summoned to the courtroom, the judge will explain certain principles of law. The prosecutor and the defense attorney will ask questions and “explore for bias.” After questioning, each side may exercise a limited number of “peremptory challenges” to excuse jurors they don’t want. The process continues until all jurors and alternates are chosen and sworn. Opening Statement: At the beginning of the trial, the prosecutor makes an opening statement that outlines the prosecution’s case against the defendant. A defense attorney may elect to make an opening statement as well, but it is not required. No argument is permitted. Case in Chief: The case brought by the District Attorney’s Office generally involves calling witnesses and introducing other evidence. The prosecutor questions each witness. Afterwards, the defense attorney may question or cross-examine the witness. The prosecutor can follow up with more questions in what’s called redirect examination. This process continues until all of the prosecution’s witnesses have testified. At the end of the prosecution’s case, the defendant may ask the judge to dismiss the charges – a request that on the theory that the trial evidence is insufficient to establish the crimes charged. Defense Case: The defendant is not required to testify, to present any witnesses or to present any evidence. If defense witnesses are called, the prosecutors may cross-examine each witness. Rebuttal: The District Attorney’s Office may present witnesses or evidence to rebut information presented by the defense. Closing Argument: The prosecution delivers a summation, at which time the evidence is reviewed and arguments supporting a guilty verdict are offered. The defense presents its closing argument after the prosecution. The prosecutor is allowed time for rebuttal after the defense’s arguments. At the conclusion of closing arguments, the judge gives final instructions on the law and explains the elements of each crime charged.